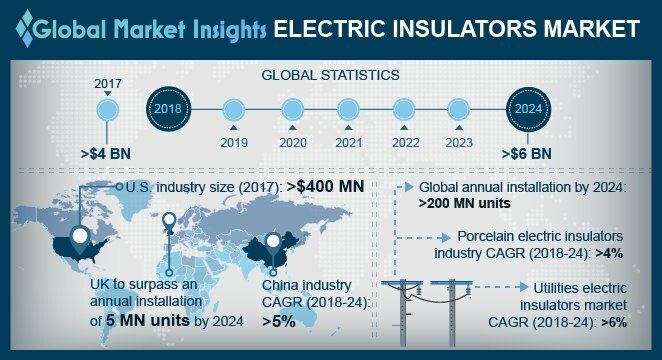 Electric Insulators Market size will exceed USD 6 Billion by 2024, as reported in the latest study by Global Market Insights, Inc. Rising investment toward upgradation of aging infrastructure to establish sustainable electrical network will boost the electric insulators market. Rising public and private investments to avail uninterrupted power supply will further enhance the business landscape. In 2017, the Asian Development Bank (ADB) declared an investment of USD 6.5 million toward the development of electrical infrastructure in Southeast Asia. UK market will exceed an annual installation of 5 million units by 2024. Increasing demand for smart grid structure along with stringent energy-efficiency protocols will stimulate the industry landscape. Channelized investment by regulators to support the electricity generation and distribution will further enhance the business outlook. Rural electrification measures across the emerging markets coupled with the increasing demand for safe and reliable power will drive the global market growth. Rigorous R&D investments favored by adoption of economies of scale by leading product manufacturers will further thrust the industry growth. Porcelain electric insulators market will witness growth on account of its technical maturity and industry dominance. Ability to perform in rugged environments with minimal leakage and corrosion while sustaining temperature changes are some of the imperative parameters that will fuel the adoption of these insulators. Rising demand for electricity along with the increasing establishment of electric networks across commercial & industrial establishments will augment the market. Government programs pertaining to modernization of power grid, including grid energy storage and smart grid development will further fuel the business growth. China market is projected to expand over 5% by 2024. Ongoing investments in the utility & industrial-based electrification systems and extensive government support for the grid refurbishment projects will drive the industry landscape. Shifting trends toward the expansion of overhead electric lines along with focus toward the development of energy-optimized products will boost the product penetration. Medium voltage electric insulators market is anticipated to witness appreciable growth owing to their wide applications in residential and commercial establishments. Favorable power distribution reforms toward expansion of distribution networks coupled with increasing commercialization will further enhance the industry landscape. Railways electric insulator market will grow owing to the rising demand for efficient network of transport infrastructure. Massive investments by government authorities for the expansion of grid networks for the development of optimized and well enhanced electric infrastructure will enhance the business outlook. Development of high-strength, lightweight, and vandal-resistant products to ensure the obstruction-free railway signals will further provide a stimulus to the industry growth. Rising demand across the primary and secondary transmission networks will augment the 145 kV electric insulator market. Ability to withstand mechanical load and operational safety are some of the key features that will support the product penetration. Key industry players operating across the electric insulators industry include ABB, Siemens, Maclean Fogg, Elsewedy Electric, Lapp Insulators, TE Connectivity, Seves Group and NGK Insulators.